Our famous multi-fuel pocket stove. Can be used with wood, other organic material, a standard Trangia burner or Esbit. Comes with two trivets for any pot size. Can also be used as a windshield/pot support for other burners. Very small and lightweight, fits into any pocket. Comes with an ash pan for soil protection. The Bushbox Set is a stove bundle consisting of the Bushbox Outdoor Pocket Stove, a grill plate and a heavy-duty black nylon pouch with a belt loop and a velcro closure to keep the kit together and protect your gear from the residue commonly found on outdoor cookware after use. The soot can easily be cleaned from the surface of the stainless steel with a coarse scrub pad or plain old steel wool. The Bushbox Stove is made in Germany from a lightweight, but rugged 14-gauge stainless steel chosen for its exceptional strength, durability and resistance to corrosion. Each piece is precision-cut leaving no burrs or rough edges to contend with. 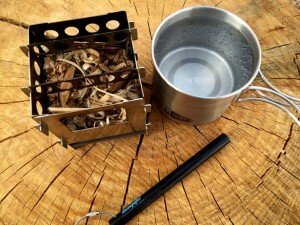 The stove by itself weighs only 9.5 ounces, but the complete kit including the grill and the pouch weigh a total of 11.2 ounces, which is still very lightweight for what you get. The parts include two side panels with legs attached, a front panel with a large rectangular access port to provide quick access for adding fuel, a rear panel, a fire grate, an ash pan, grill and two adjustable trivet pot supports. For those who follow the leave-no-trace mantra, the ash pan prevents any hot embers from scorching the earth by keeping them far enough away to protect the surface of the ground. Fully assembled, the Bushbox sits 4.5″ tall, and 3.5″ square with a 27 cu inch firebox. The Bushbox packs down flat taking only 6″ x 5″ x 0.5″ including the nylon pouch so it will easily fit in most any pocket in your pack. Need a larger packable stove, check out the Bushbox XL. They also have a titanium model weighing 5.64 ounces less as well as a micro model about one-quarter the size. The Bushbox Stove can easily be adapted to cook and generate heat in most environments. It can not only be fueled by wood and other organic combustible materials like coal, pine cones and tree bark. It can also be used with a standard Trangia alcohol burner and solid fuel tablets to provide a fuel stand, pot support and windscreen making it an extremely versatile pack stove. Assembly of the Bushbox is rather straightforward. You start with one side, sliding the two tabs of the rear panel together with the two tabs of side panel until they slide past the locking nib. Next, add the other side panel sliding its tabs together with the tabs on the rear panel. Then insert the fire grate and ash pan into the appropriate slots. The final step is to slide the four tabs on the front panel together with the tabs on each of the two side panels locking all four sides together. There are a number of air holes strategically placed around the perimeter of the stove and the lower fire grate that allow oxygen to enter and circulate through the firebox providing a more efficient burn. The front access port provides ample room for small sticks and twigs to be added while the fire is burning and a pot is sitting on top of the stove. Since the opening is positioned nearly 1.5″ above the fire grate, the hot embers are always contained within the firebox making it much easier to add fuel as you go. When using cookware that is larger in diameter than the stovetop, it is important to set the trivets so they can elevate the cookware high enough above the top of the stove to provide ample room below keeping the heat from being diverted out the sides of the firebox. To configure the Bushbox for use with a Trangia alcohol burner, simply use at least one of the trivets to link the two sides together instead of the front panel with the access port. 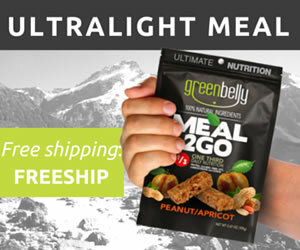 This will provide the stability necessary to support your cookware and the weight of a fuel canister inside the firebox. If you happen to be using the Bushbox with solid fuel tablets like Esbit and hexamine, the grill can easily be configured as a supporting platform for the fuel tablets allowing the flame to reach the bottom of the pot. With the trivets in place the Bushbox can easily accommodate cookware as small as a 450ml cup or Nalgene bottle all the way up to a 1.5-quart pot. While larger cookware may be possible, this small Bushbox will become more and more unstable as the size increases. If you need to use cookware larger than 1.5-quarts, I recommend looking at the XL model instead. 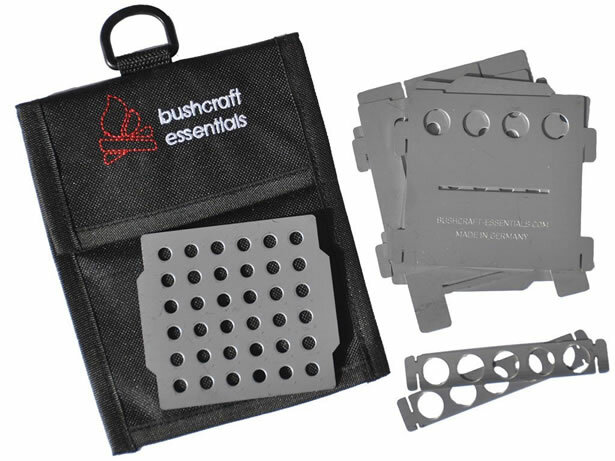 Additional grill plates and trivets can be purchased separately in addition to couplings and other various plates directly from the Bushcraft Essentials website located here. To test the efficiency of the Bushbox Stove, I figured the best test would be to see how long it would take to boil 4 cups of water. To get things started off, I gathered together a pile of small tinder so that I could continually feed the stove as necessary to keep the fire going long enough to reach a rolling boil. With small stoves like this, I typically like to gather enough tinder of various sizes to fill the firebox at least four to five times over. Additionally, I like to build the fire using the up-side-down method, where you add your larger tinder at the bottom and your smaller material at the top. Once the fire is lit, it will burn downward creating a nice hot bed of embers. Then it is just a matter of adding combustible material as needed until the water is boiling. As soon as I had the fire going, I placed a 550ml stainless steel mug with 2-cups of water on top of the stove to let it do its thing. I did not have a lid so I knew it would take a bit longer than it would if I had one. As time went on, I added just enough wood through the opening in the front panel to keep the fire roaring, but not blazing. There was a little breeze blowing through so it took a little more than 10 minutes to bring the water to a rolling boil. I figure that I had to refill the firebox at least a few times over. Once the pot reached a boil, I quickly removed it from the stovetop, dumped out the hot water, and refilled it with cold water to run the test again. The second test would be with the stove already hot so it shouldn’t take near as long to get the water to a rolling boil. I quickly refilled the firebox with more tinder before it burnt itself out and placed the mug full of water back up on the stove. After a couple refills of the firebox, the water began to boil, and this time it took just shy of 9 minutes to get it there. 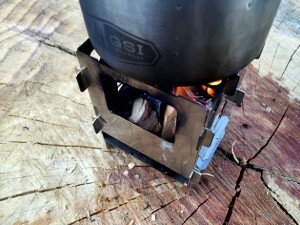 The Bushbox Stove cooled rather quickly once it burnt itself out so it wasn’t long before it could be broken down. 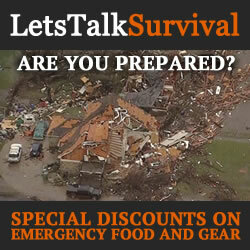 It is important not to use water to cool the stove or risk warping the sheet metal. It is best to let it air cool, though it is possible to help it along simply by dumping out the embers if you must. To combat the soot residue left on cookware from wood-burning fires, I have found that applying a thin layer of soap prior to using them will make them easier to clean, just as you would when using solid fuel tablets. The Bushbox Outdoor Pocket Stove from Bushcraft Essentials is made from quality materials, precision cut so everything fits tightly together creating a solid cooking platform. However, that tight tolerance does come at a price. The parts fit together so tightly, the stove is a little difficult to disassemble when you are in a hurry. The little nibs that lock the tabs together do not always want to let go without a little extra fiddling and effort. Overall I was pretty happy with the performance and stability of the kit, and even more so with its compactness. That is the beauty of this kit, it is so compact that you can stow it almost anywhere, even in your back pocket. I would love to check out the titanium version of this stove to see how well it compares. If you are looking for a compact packable wood-burning stove, the Bushbox Kit is definitely worth a look.